The Institute of Christ the King is, for ecclesiastical standards, a very young foundation. Our founder, Monsignor Gilles Wach, STD, supported decisively by the co-founder, Father Phillipe Mora, STD, had the Institute canonically erected the Semptember 1, 1990. 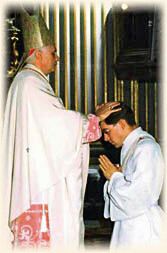 Originally, the young French abbé, Gilles Wach, never intended to start a foundation at all, but during the 1980's, working for Cardinal Silvio Oddi in Rome and with a priestly association in France, he was approached by more and more young men who wanted a traditional Catholic formation to the priesthood. Finally, he decided to make an attempt to bring them together and to follow their formation in some way. Several Roman Cardinals, though, urged him to decide for the foundation of a religious community, so that the idea of the Institute took form already as soon as 1988. Divine Providence, at this moment, helped to find a bishop who was ready to give this courageous enterprise a canonical foundation. At that time, the situation in France was too tense to realize the idea of the Institute in the home country of our founder, but God is very inventive. He finally brought us in contact with the late Bishop Obamba of Mouila in Gabon who invited the young community to help him in his Diocese with missionary work and gave it the needed canonical erection. 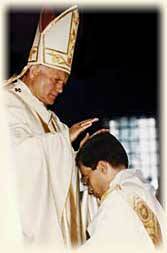 At the same time, he appointed our founder his Vicar General, with which goes officially the title Monsignor. Soon, with the help of the German Augustinus Cardinal Mayer, OSB, a member of the Roman Curia, Monsignor Wach was able to find an appropriate location for the Seminary and Motherhouse of his quickly growing community. The Benedictines of Fontgombault in France, who meanwhile founded a monastery in the state of Oklahoma in the United States, had decided to close a priory that they maintained in Gricigliano at a very old summer villa of the Counts Martelli near Florence in Tuscany. Because of the regulations of the estate of the last Countesses, they had to find a successor who would take over the building and guarantee the celebration of the traditional Mass at this place. We were very happy to be able to accept this generous offer, especially because the Archbishop Silvio Cardinal Piovanelli was immediately ready to give our Motherhouse and seminary canonical erection in his diocese. From this day forward, the history of the Institute has been a history of steady growth and more and more apostolic work around the whole world. Soon, apostolates in France, Spain, the United States, South America, Belgium, Switzerland, Austria, and Germany could be opened. More and more seminarians joined the Institute to have a traditional Catholic formation to the priesthood. 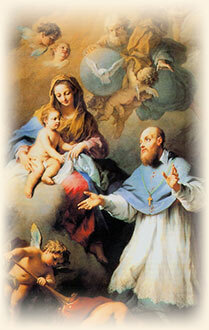 The spirit of St. Francis de Sales, expressed in the motto of the Institute, Veritatem facientes in caritate ("live the truth in charity"), made the Institute under the guidance of Monsignor Gilles Wach into a family of priests and non-priestly members which is centered on the worthy celebration of the Holy Mysteries, the proclamation of the whole Catholic Truth, and a genuine Catholic lifestyle. Grace, truth, charity, and culture are elements of "family life" which are typical in the houses of the Institute. We are always happy to hear that the faithful who visit our apostolates and priories notice the atmosphere of the Institute's particular spirituality present in all the environments in which we live. "Cook the truth in charity until it tastes sweet"—this famous quotation of St. Francis de Sales is the principle of our apostolic work. Fruitless discussions or, worse, uncharitable polemics never help to attract souls to the Lord. Again, St. Francis de Sales said, "One drop of honey attracts more bees than a barrel of vinegar." The revealed truth of our Holy Catholic Faith is in itself attractive because of its depth, brilliance, and logic. Wherever it appears clothed in the beautiful garments of charity, it becomes ever more acceptable to those who might otherwise fear its inevitable consequences for our lives and the sharpness with which it cuts through our weaknesses and our excuses. The famous religious poet, Gertrude von Le Fort, wrote of the Church and the revealed Truth, "I have fallen in your Faith like in an open sword, and you have cut all my anchors." How much more easily does a soul accept the grandness and the majesty of Divine Faith when it is presented with the merciful charity and patient meekness which Our Lord himself shows all the time to His children. That is the reason why the members of the Institute of Christ the King Sovereign Priest strive to follow the example of St. Francis de Sales, who was, at the same time, one of the most knowledgeable theologians of his period and the "Doctor of Charity." Certainly, our attempt to teach truth with charity and to live also in our communities a life according to the great commandment of charity is a goal that can only be achieved with a daily struggle against one's own shortcomings and continuous collaboration with the gifts of grace. Charity does not replace daily mortification. On the contrary, he who wants to be full of charity towards the Lord and his neighbor must mortify his own will continuously. This is why St. Francis de Sales, the great teacher of Divine Love and apostolic charity, has rightly been called "the most mortifying of the Saints." "To be Good at What We Are"
The fact that, after nearly twenty-five years of existence, the Institute counts 80 apostolates in twelve countries, 80 priests, and more than 90 seminarians is perhaps sufficient proof that the Institute is on the right path within the Church. However, it is not our intent to grow quickly and to become mushroom-like, that is to say, big and weak. Rather, we desire to consolidate our Institute by a careful selection of possible candidates and by an always-growing emphasis on a solid community life according to our own spirituality. We do not press our candidates into a mold or a certain typical uniformity of mind and expression, but, here again, we follow St. Francis de Sales. The holy Doctor entreats us "to be good at what we are," which means that through the collaboration with the grace of God, everyone must develop his own various talents and gifts according to the Will of the Lord and to eliminate from his character those traits which are opposed to the divine teachings. This is indeed the ongoing struggle of a lifetime. However, there are appropriate instruments which give us the strength never to give up this battle: a fraternal community, the participation in the mysteries of the liturgy, and the continuous study of the marvelous tradition of the Church as reflected by Scripture and the Magesterium. Thus we can advance every day with renewed joy and confidence. 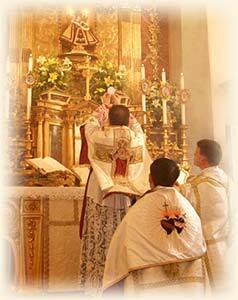 "The mission of the Institute of Christ the King Sovereign Priest is to spread the reign of Christ in all spheres of human life by drawing from the millennial treasury of the Roman Catholic Church, particularly her liturgical tradition, the unbroken line of spiritual thought and practice of her saints, and her cultural patrimony in music, art and architecture. The Institute accomplishes this primarily through a solid and well-rounded formation of its priests, rooted in Catholic tradition and carried out at its international seminary in the Archdiocese of Florence. 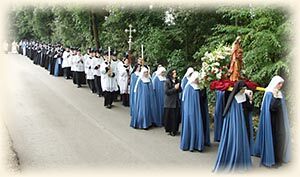 Our priests, conscious of the need for their own sanctification, strive to be instruments of God's grace through their apostolic work discharged in the churches assigned to the Institute, its schools, its missions in Africa, by preaching retreats, teaching catechesis, and providing spiritual guidance. 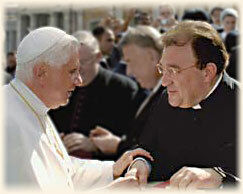 The Institute of Christ the King operates under the patronage of the Immaculate Conception, to Whom it is consecrated."